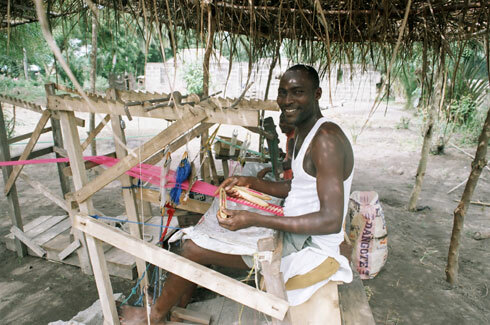 Kente village weaver. They love their work - you will love to wear their products.. Photo by Muguette Goufrani. Africans are painting the world in a kaleidoscope of bold, vibrant colour combinations and dazzling patterns. The rich fabrics and virtually unlimited selection of turbans and other festive headgear, bright scarves, colourful wraps, wearable art and elegant gowns that brightened our days and lit up our evenings in Morocco, Kenya, Ethiopia, Cameroon, Cote d'Ivoire Uganda, Benin, Ghana, Tanzania, Guinea and other African destinations, were simply outstanding. What's more, so were the creators. During the past decade as publishers, we've had the privilege of meeting several of the brightest stars in Africa's fashion galaxy, and thanks to the magic of serendipity, more will surely appear in the near future. As I've learned, in many African societies, the choice of colours and textiles has special significance to the wearer. For example, hats often tell stories of everyday life, with its struggles, spiced by uplifting periods of joie de vivre. While I have lived and worked in various North and West African countries in my earlier career as an airline and travel agent, my media involvement has brought the importance of African fashion into sharp focus. How did this love affair start? Perhaps it was at the first Africa Travel Association Fashion Show, organized by Chief Margaret Fabiyi of Lagos, Nigeria. The 'Chief' has supplied many of my favorite wardrobe items ever since. Here are some brief comments about her and others in this fascinating field. It's amazing! For the past five years, the most popular section on this web site, according to Webtrends, which charts our page views day by day, is Africa Travel Fashions. Since Africa Travel Magazine's editors believe in giving readers what they want, each new edition of our printed magazine contains additional pages featuring the colorful clothing, designers and fabrics of Africa,. In addition, there are visitors tips on what and where to buy Two years ago at the huge Merkato Market (the size of several football fields) and other unique spots in Addis Ababa, we were in Shoppers' Heaven. The prices were exceptional with our exchange rate and the variety of items was endless. When myself and the Editor of Africa Travel Magazine, visited historic Kumasi with our guide from Sagrenti Tours of Accra, Ghana, we made several trips to the weavers village which is located nearby. As in the big city markets, were overwhelmed by the wide variety of Kente cloth items available. Be prepared to bargain - it's part of the scene. The caps, shirts and other goods we bargained for have since proven to be of excellent quality - they never seem to wear out. The question that arises most often when other North Americans see us wearing our African duds is -"What is Kente cloth?" We would need a whole web site or catalog just to cover fashions, wearable art, fabrics and shopping venues in Ethiopia, let alone what I've already experienced in Togo, Gabon, Cote d'Ivoire, Morocco, Tanzania, Ghana, Kenya, South Africa and various other destinations we've visited. We're now considering a special edition of our magazine devoted entirely to African travel fashions with a gallery of color photos. For traveling, attending gala events, meetings, or looking good for any occasion, has been a number one topic in Africa Travel Magazine and its powerful website. We use Webtrends to monitor our site, plus the power of Google and Yahoo to see how we stack up against other media. You will be surprised. Below is a link to my first article on the subject of hats. I have a passion for hats, as you will learn.